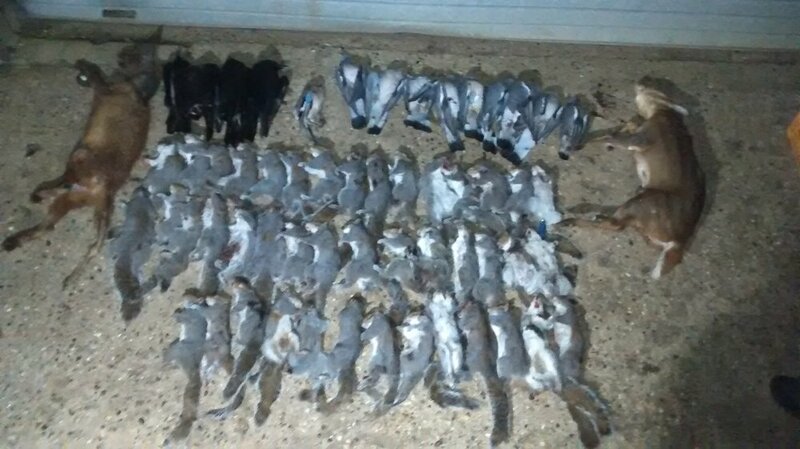 As a man who keeps dogs not guns i hope i'm posting in the right place,but had a vermin day yesterday on part of an estate i do the terrier work on,had a few mates over who do shoot and who've been taken the p*ss out of by the shoot they usualy beat on by being given a poor beaters day then refused a vermin day.Well i sorted that out for them and we had a cracking day with a couple short of 50 squirrels,a very mange ridden vixen about to drop a litter destined for a cruel life of scratching themselves to death,a 3 legged muntjac who had hooves like you see on donkey welfare video's and a few other odd and sods,a bit of roost shooting but with a misty still day that wasn't brilliant but a cracking day was had by all and i even shot a box and a half of cartridges for a squirrel and a crow myself . Cracking job ,How do you reckon the munty lost a limb fox wire or hit by a vehicle? It was a back limb and just below her knee joint (her back left hand leg,you can just make it out on the pic)and it was just about healed,a few of us had a chat about it after the drive of the woods and we all thought a car had done it rather than a wire as our keeper don't run wires and the surrounding keepers don't either.Both that fox and that muntjac were done favours and it's by the grace of god we've had a mild winter or they'd have both died very slow cruel deaths if it were cold and snowy.. The mange has thankfully missed our area but Oxford and surrounding counties had it bad this year . You would think with the milder weather ,foxes wouldn’t be going to ground and catching it from previous tenant .Stress is a big factor I’m told .Horrible fate and better out the way . Demadectic mange (spelling ?) is caused by stress,it's the parasite all dogs have but their own immune system keeps it in check,it's when stress causes and unbalance in that immune system the parasites numbers increase and it turns into mange. Sarcoptic mange is a straight parasite and can be caught by any dog or fox or even human as it's scabies in humans.. They banned boomerangs ? That’s going to come back on them.